Loch Lomond and Helensburgh Photography: SONS DANCING IN THE STREETS OF RAITH! SONS DANCING IN THE STREETS OF RAITH! DUMBARTON pulled off a tremendous 3-1 victory overs Raith Rovers in a constant downpour at Stark's Park, Kirkcaldy. DUMBARTON pulled off a tremendous 3-1 victory overs Raith Rovers in a constant downpour at Stark's Park, Kirkcaldy, in front of a 1,314 crowd which included 89 Sons supporters. With new assistant manager Ian Durrant in the dugout Sons survived the loss of an early goal to move to a point behind Gary Locke's Fife side. Both sides were lively from the outset, with the visitors mounting several promising early attacks on a very wet and cold day. Sam Stanton, Christian Nade and Robert Thomson all came close for Sons in a hectic first 20 minutes, while Alan Martin made an important save at the other end. On 26 minutes Gregor Buchanan was bundled off the ball as Raith pressed. But referee Mat Northcroft waved play on as Mark Stewart squared his layoff for Ryan Hardie to drive home to make it 1-0 to the home side. Four minutes into the second half, Sons were deservedly level. A fine ball in from Daniel Harvie found Nade, who headed down to bounce it into the top corner of the net. Dumbarton were appealing for what appeared a clear penalty moments later. But the referee was unmoved and caused fury from the away side by booking Andy Stirling instead. On 56 minutes Harvie put Sons 2-1 ahead, exploiting the space around him well to pick his spot from 20 yards. Just after the hour Dumbarton made it 3-1, as Buchanan converted a corner at Rovers' far post. Calum Gallagher made his first appearance for Sons when Christian Nade came off after sustaining a knock on 64 minutes. Raith pressed hard in the closing minutes, but Sons held on with assurance for a well-earned three points. 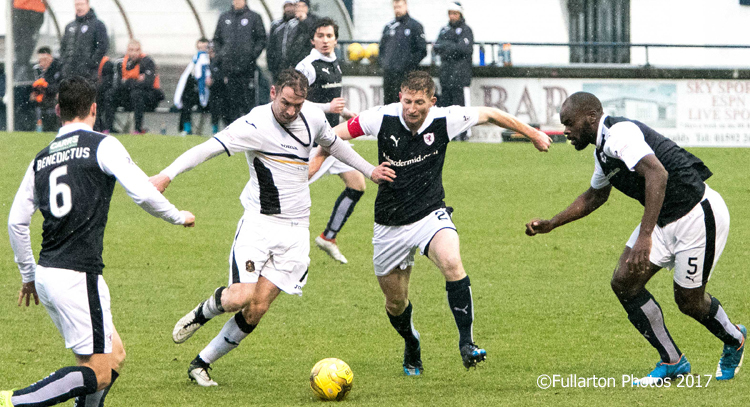 Robert Thomson is pictured holding off Raith captain Jason Thomson.